A glossmeter measures the specular reflection. The light intensity is registered over a small range of the reflection angle. 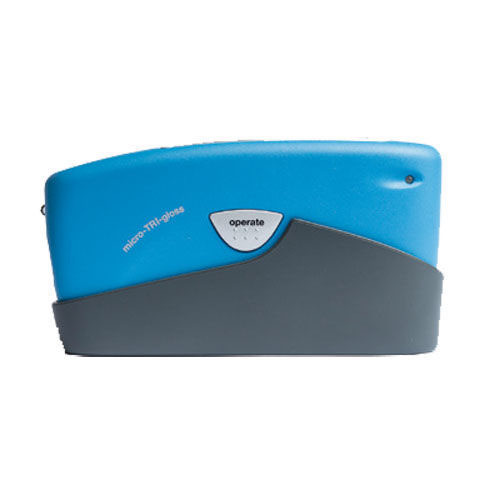 Our comprehensive range of competitive and reasonably priced gloss meters include economical models as well as advanced versions measuring single angles or TRI angles. The measurement results of a gloss meter are related to the amount of reflected light from a black glass standard with a defined refractive index, and not to the amount of incident light. The measurement value for this defined standard is equal to 100 Gloss Units (calibration). The intensity is dependent on the material and the angle of illumination. In case of non-metals (coatings, plastics) the amount of reflected light increases with the increase of the illumination angle. The remaining illuminated light penetrates the material and is absorbed or diffusely scattered dependent on the colour. Materials with a higher refractive index can have a measurement value above 100 gloss units (GU), e.g. films. In case of transparent materials the measurement value can be increased due to multiple reflections in the bulk of the material. Due to the high reflection capabilities of metals values of up to 2000 GU can be reached. 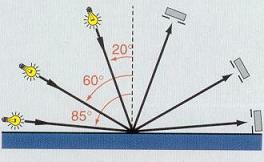 For these applications, it is common to document the measurement results in % reflection of the illuminated light. In this case study 13 samples were visually ranked from mat to high gloss and measured with the 3 specified geometries. In the steep slopes of the curves the differences between the samples can be clearly measured, while in the flat part the measurement geometry no longer correlates with the visual. In addition, there are industry specific applications for 45º and 75º measurement geometry. 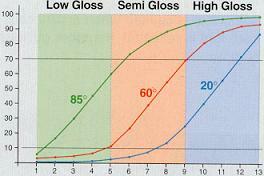 Gloss Meter - Micro-Gloss S is for toughest specifications - ensure harmony of interior parts.